This year for my Christmas cookie baking, I wanted to make a Linzer sandwich cookie in a gluten-free version. I find it easy to update many of our favorite Christmas cookie recipes to gluten-free versions I can eat. Digging into the family cookbook once owned by my husband’s grandfather, I found a recipe I could convert to a gluten-free cookie. I also updated the ingredients to modern measurements and ingredients. The original recipe for this week’s treat is Pate Sucre (French Cookie Dough). Written in my husband’s grandfather’s handwriting on one of his business invoices, the original recipe is a terse one. 1 lb. butter ½ lb. sugar 2 eggs 2¼ tsp baking powder 1½ lb. flour 1 teaspoon vanilla or lemon extract a few grains of mace Mix into a stiff paste. Bake at 375 for 15 to 16 minutes. Watch for the last few minutes since the cookies burn easily. Good dough for rolling out. Freezes well. Mix into a stiff paste. Bake at 375 for 15 to 16 minutes. Watch for the last few minutes since the cookies burn easily. Good dough for rolling out. Freezes well. I went through 2 batches to make a gluten-free version of Pate Sucre. In my first batch, I used more rice flour than almond flour, making the dough a bit sweet in my opinion. My goal was to create a cookie just tasty enough to be eaten alone with coffee or tea, or to serve as the foundation for a Linzer sandwich cookie, 2 cookies sandwiching a teaspoon of jam. To make the cookies, I used the Wilton Halloween Linzer Cookie Cutter set given to me by a friend. I found the set to be a bit fussy, plus I had a difficult time removing the dough from the small cookie cutter and the top of the big cookie cutter. Even though it’s an extra step, I would cut 2 plain rounds and then use the small cookie cutter to remove the middle of one round. Cream butter and sugar in a mixing bowl. Add in eggs, and vanilla and almond extracts and thoroughly mix. Mix together the almond flour, rice flour, and baking powder in a separate bowl. Slowly incorporate into the butter/sugar mixture until completely mixed. Chill the dough in the refrigerator for at least an hour. Roll out dough and cut out cookie tops and bottoms, making sure to do an equal number of each. Place the unbaked cookies on a cookie sheet lined with parchment paper. Bake at 350 for 10 to 12 minutes until lightly browned. Cool for 10 minutes on cookie sheet before removing cookies to a cooling rack. When thoroughly cool, place about 1 tsp of jam on the bottom half of the cookie and place the top of the cookie on top of the jam. 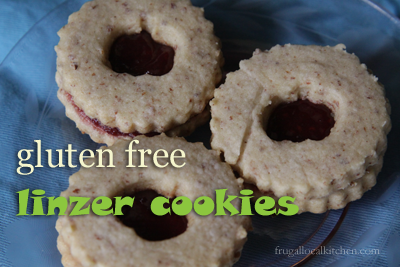 Gluten-free linzer cookies? You’re a GENIUS! I love this! They’re definitely on my list for making this holiday! Glad to see that you found a good balance for the gluten free! I love old family recipes, especially handwritten ones. They are like delicious little pieces of history! Your Linzer cookies look so good. Linzer cookies are one of my favourite treats. It’s lovely you were able to make them gluten free.